New Year! New Venue! New Event! Doors will open at 6:30pm, and guests will be treated to 2 free drink tickets, delicious hor d’oeuvres, the always crowd pleasing mashed potato martini bar and a savory beef carving station. The night will include a short live auction, a silent auction, raffles and more. We will end the night with a rousing performance from Bic & the Ballpoints which is sure to have everyone on their feet. Tickets are $125 each with a $50 tax receipt. Tickets can be purchased online here or in the President’s Office located in Mullock Hall. 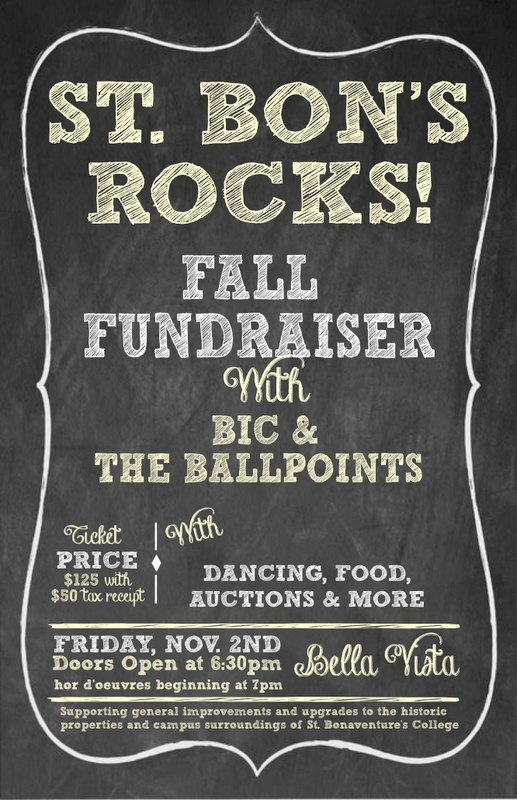 Gather a group together or come out to meet new people for what is sure to be a fun night in support of St. Bon’s. We are looking for items for our live auction, silent auction and raffles. Items can be dropped off to the President’s Office, and if you have a receipt or appraisal for the item we can issue a tax receipt. For a list of auction and raffle ideas, please click here. Another great way to support this event is to become a sponsor. There are a number of sponsorship packages available. To learn more about becoming a sponsor please click here or contact Ms. Krista Cardwell at kcardwell@stbons.ca or 726-0024 ext. 200. The proceeds from this Fall Fundraiser supports building improvements to Mullock and Holland Hall. The 2017 proceeds have been used to upgrade our buildings and campus, including the two new classrooms in Holland Hall, plumbing and electrical improvements in both buildings, roof repairs, etc. Our goal this year is to raise $60,000.